When we look for advice on how to study better, most articles trot out the same old advice: create a study schedule, review it frequently, get plenty of sleep, and so on. Now while tips like these will almost certainly be effective in helping you reach your goals, we’re going to go a step further. We’re going to give you tips that aren’t so common – but ones that will help propel you beyond 99% of your fellow students all the same! Generally speaking, students look for good, reliable notes (either from classmates, books, online or resources) and then rush off to school, feeling well prepared. This approach can be successful, but in order to excel, it’s best to compare several sources (books, presentations, videos and so on) and combine these together by creating your own study material. By doing this you can ensure that your study material doesn’t remain static, but continuously improves. If you find something new or interesting that’s related to the topic, then add it in. This will help you to deepen your understanding of the issue as you’ll have examined multiple points of view. You can then form your own informed opinion on the matter – something that will be lacking in most of your peers. It’s nothing new for students to simulate a test environment and create or participate in quizzes to see how much they know about a subject. However, most students test themselves like this when it is too late and exams are already steadily approaching. The solution is to make and take small tests regularly from the beginning. If you can make a habit of this and incorporate it into your study routine then you’ll have a much clearer idea of how you’re progressing and any areas you might need to brush up in. Not only will doing so help you retain information for longer, it will also reduce your stress levels and prepare you for an exam-type environment. In many cases, what really distinguishes the most outstanding students isn’t their academic intelligence but their emotional intelligence. “So what’s that?” you ask. Well, emotional intelligence relates to your ability to stay motivated and cope with stressful situations. Research by Stanford University actually found that students’ emotional quotient (their EQ) was actually a better predictor of success that their intelligence quotient (IQ). How you perform over time basically comes down to whether you have a fixed mindset or a growth mindset. Those with a fixed mindset fixate on problems and feel overwhelmed, while those with a growth mindset embrace challenges and treat them as a chance to learn something new. A good strategy to build a growth mindset is to meet your learning needs head on. Try not look at studying as merely being part of exam preparation as this puts the emphasis on being examined instead of instead acquiring knowledge. If you focus on learning instead of cramming, your understanding of a topic and your ability to recall information about it later will be far better. So approach your studies in a positive way by viewing learning and knowledge as valuable ends in and of themselves. It may seem ironic that one of the tips on how to study better than 99% of your classmates is by not comparing yourself to them, but that doesn’t mean it’s not true – in the end, success means something different to each of us. Therefore, the top students do not pay attention to what the next person is doing because they’re focused on their own needs and goals. Aside from that, comparing yourself to others only puts creates undue pressure and restrains both levels of motivation and creativity. So don’t get bogged down in competition by trying to emulate someone else – follow point 3 and use you emotional intelligence to self-motivate your way to achieving your own success. In line with the above, what really matters is your personal learning experience. Even if you know that you can get the answer to an exercise you’re doing on the Internet or from a friend, take a step back! Of course you can ask others for their help, but always put your personal learning goals first and foremost. 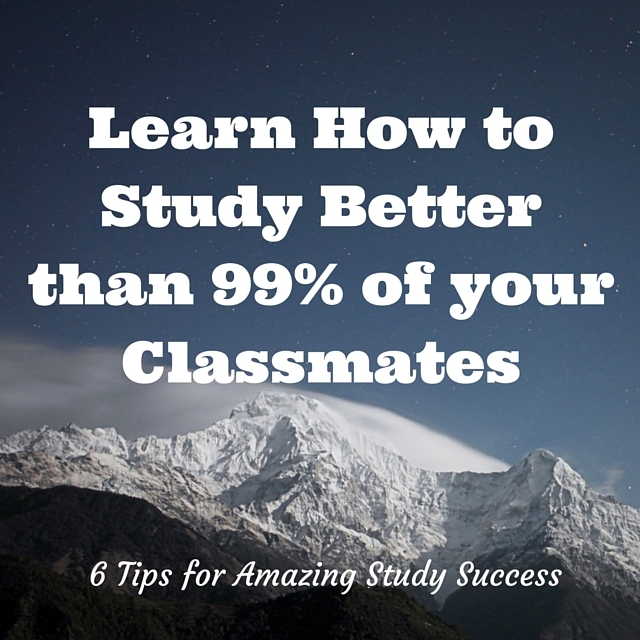 Get the information you need about how to study better and find your own answers.